Following a 36-week flight from Earth, Nasa’s Curiosity Mars Rover has touched down on the Red Planet to begin a two-year investigation to look for evidence of life. This concept graphic shows the design of the Curiosity Rover, NASA’s most-advanced Mars rover. 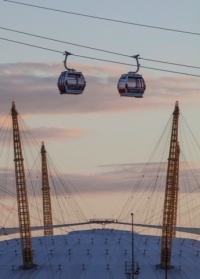 Developed at a cost of $2.5 billion (£1.6 billion), it is 3m-long, 2m-high and weights just under 4000kg. 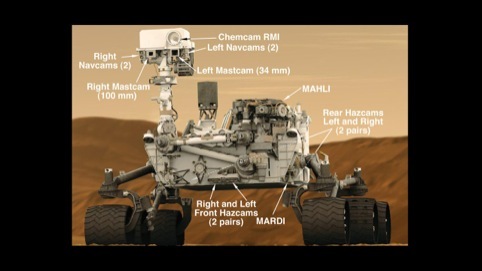 This graphic shows the position of the cameras on the Curiosity Rover. The vehicle is carrying 75 kg of scientific instruments – some 15 times more than previous Mars missions Spirit and Opportunity. 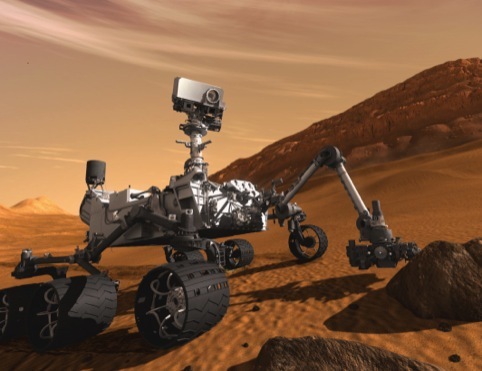 Some of the tools are the first of their kind on Mars, such as a laser-firing instrument for checking the elemental composition of rocks. This image shows the Gale Crater, where the Curiosity Rover landed. The site was chosen so that that Rover is within driving distance of the layers of the craters interior mountain. During its mission Curiosity will travel around 20km across the surface of Mars. This graphic shows the landing area for the Curiosity Rover. NASA technicians said guiding the vehicle to this landing site was like threading a needle. This ‘map’ shows the weather conditions for Mars, pointing out the Gale Crater landing site. The weather on Mars is currently ‘clear and seasonal’, according to NASA. 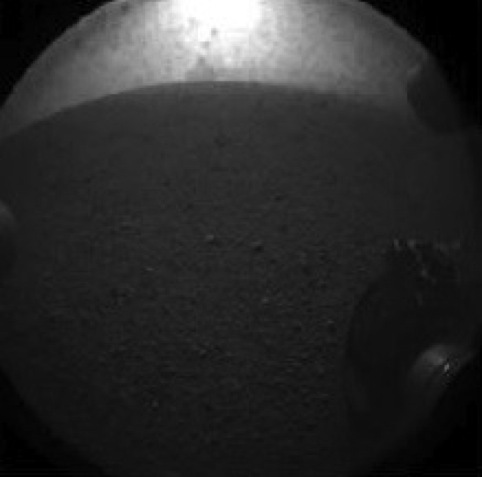 And these are the first images broadcast by the Curiosity Rover. The rover’s early engineering images will be in lower resolution, but larger colour images are expected later in the week when the rover’s mast, carrying high-resolution cameras, is deployed. 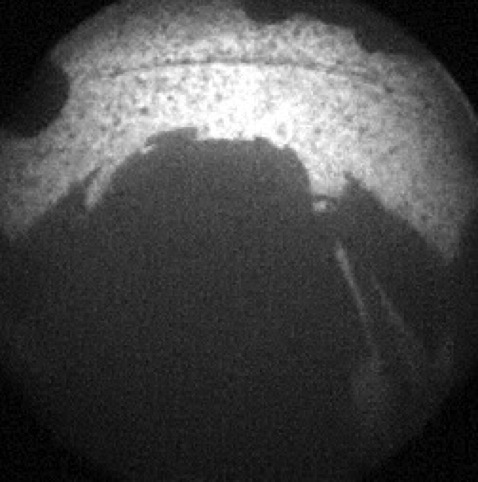 This image shows Curiosity’s shadow on the surface of Mars. This image was taken at the same time, using a fisheye wide-angle lens. The clear dust cover is still on the the camera, and dust can be seen around the edge. Curiosity will be hoping to avoid dust-storms, like this one from 2007 pictured by NASA’s Mars Reconnaissance Orbitor. 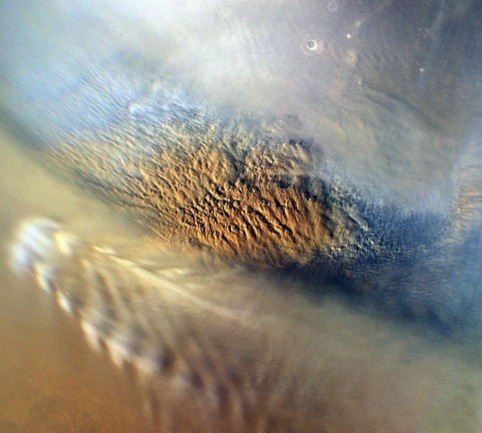 It will be looking for evidence the Mars might have supported life in the past. There is plenty of evidence that this might have been the case. This image shows rhythmic layering in the Danielson Crater, demonstrating how sediment built up following periodic changes in climate. This colour-coded image shows the topography of Mars, with large ancient valley networks and outflow channels clearly visible. And ice is clearly visible buried under the surface of Mars and revealed by this fresh crater.